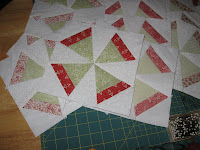 Well, all the quilt blocks are sewn and now the piecing begins. I have already sewn together 2 of 5 rows then there will be a narrow border and a wider border. I haven't decided on the fabric for the backing yet and am not sure what kind of batting I want to use either. This quilt is only about 50"X50" so it will probably just be used on the table or hang on the wall. It was really intended for me to figure out if I want to do any more quilting. Maybe I should just make it bigger and make it a quilt for the couch. I am really nervous about the actual quilting part and not quite sure if I want to do it by hand or on the machine. For now though I have to get it put together first. Tomorrow is another day off! It is suppose to be raining. 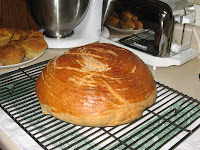 Last time I had a big block of time off I baked bread and it turned out really good if I do say so myself. Sounds like a fun thing to do on a rainy day! Maybe I will try that again. Last time I added some herbs and asiago cheese maybe I will have to experiment with something different this time. Well, I am off to start another day and a busy one at that, but then I will be relaxing for the next 3 days and just having fun being at home! Feel free to leave comments on my blog they are fun to read.